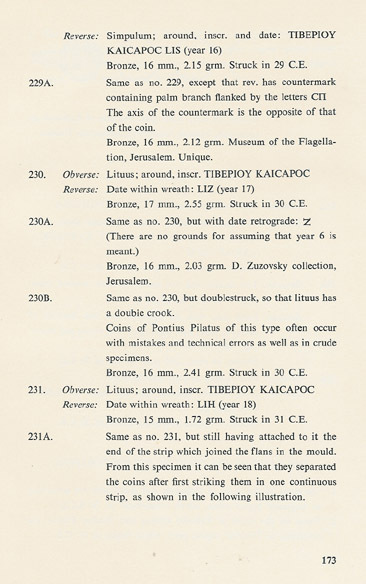 you will find the pages to these coins according to the book of Ya'akov Meshorer, Jewish Coins of the Second Temple Period, Tel Aviv 1967. at the end of the listing. 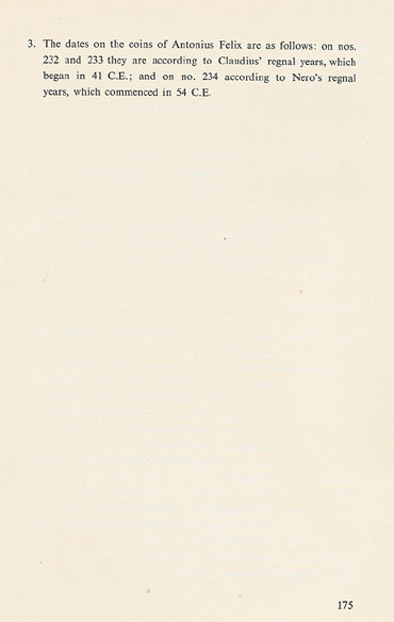 There are no substantial changes against the later editions of Meshorer. The palm depicted is the date palm. The tree was a symbol of Judea where palm tress grow in greater numbers than the surrounding areas. 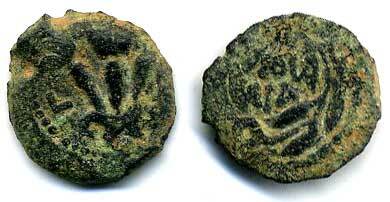 The Romans also used it as a symbol of Judea on Judaea Capta coins. The palm also symbolized abundance and plenty, dignity, royal honor, jubilation and victory and was used in religious processions. 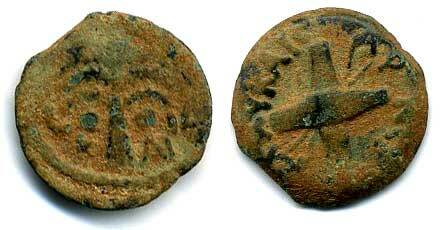 According to the Jewish historian Flavius Josephus, Marcus Ambibulus was one of the Roman governors of Judaea. His tenure of office is usually dated between 9 and 12, although a slightly later date is possible. Although Josephus does not mention Ambibulus' exact titles, we know from an inscription found at Caesarea that one of his successors, Pontius Pilate, was a perfect, so we can assume that Ambibulus was a prefect too. We know hardly anything about the man, although, as a prefect, he must have belonged to the equestrian order - the second class of the Roman elite, after the senators. He was appointed by the emperor Augustus and succeeded Coponius. 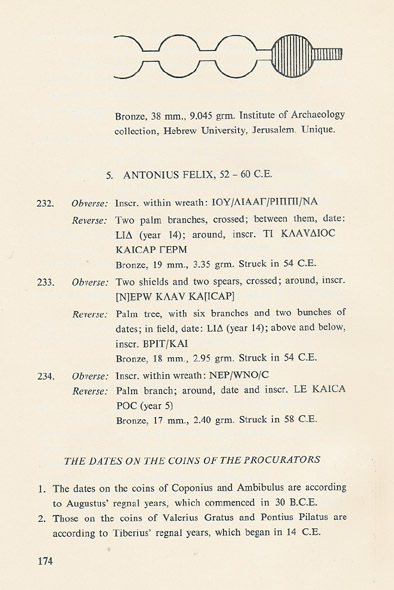 Josephus writes: Marcus Ambibulus came to be Coponius' successor. During his governorship, Salome, the sister of king Herod, died, and left to Livia Jamnia, all its toparchy, and Phasaelis in the plain, and Arehelais, with a great plantation of palm trees that offers fruit that is excellent in its kind. After Ambibulus came Annius Rufus. 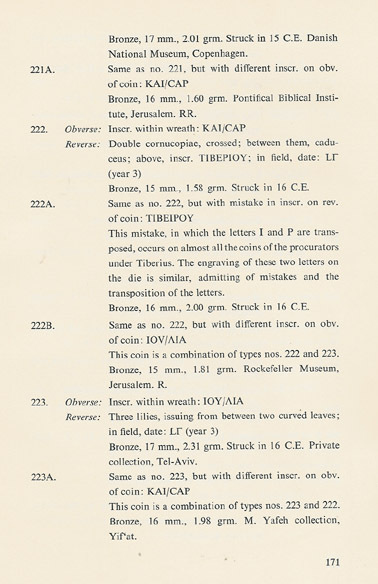 [Flavius Josephus, Jewish Antiquities 18.31] This is all we know about this Marcus Ambibulus. Probably, he did his job well, because a bad governor would have been faced with rebellion, something that Josephus is always eager to mention. His silence suggests that Ambibulus was a fine administrator. 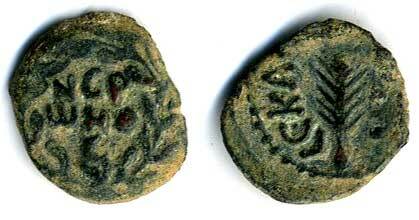 The name Julia, in Grece IOYLIA, is found a lot of the Procuratorien coins. 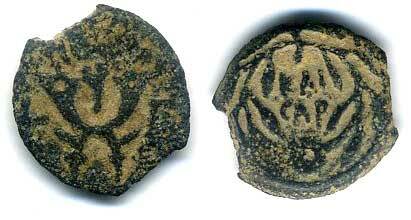 Julia had great possessions in Eretz Israel, for instance the oasis of Jericho. LIVIA•DRVSILLA, LIVIA•AVGVSTA) (58 BC-AD 29 ), after her AD 14 marriage called Livia Augusta, and often known as Olivia Druscilla, Julia Augusta, and Caesarina Olivia, was a Roman empress as the third wife of the Emperor Augustus and his adviser. She was the mother of the Emperor Tiberius, paternal great-grandmother of the Emperor Caligula, paternal grandmother of the Emperor Claudius, and maternal great-great grandmother of the Emperor Nero. She was deified by Claudius who acknowledged her title of Augusta. Obv. : Inscription in wreath: IOY/LIA Rev. : Palm branch; across field: LB (year 2) = 15 CE. Bronze prutah. 1.95 gram. 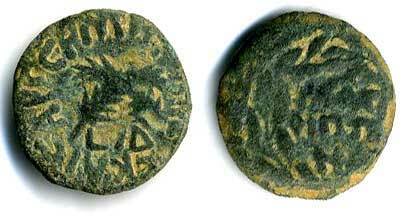 Valerius Gratus was Roman Prefect or procurator of Judea under Tiberius, AD 15 - 26. He succeeded Annius Rufus and was replaced by Pontius Pilate. The government of Gratus is chiefly remarkable for the frequent changes he made in the appointment of the high-priesthood. He deposed Ananus, and substituted Ismael, son of Fabi, then Eleazar, son of Arianus, then Simon, son of Camith, and lastly Joseph Caiaphas, the son-in-law of Ananus. Obv. : Inscription in wreath: KAI/CAP Rev. : Double cornucopiae, crossed, above , incr. TIBEPIOY across field: LG (year 3) = 16 CE. Bronze prutah. 1.75 gram. Obv. : Inscription in wreath: IOV/LIA Rev. : Three lilies; across field: LG (year 3) = 16 CE. Bronze prutah. 1.75 gram. Obv. : out of center. Rev. : narroe necked amphora; across field: LD (year 4) = 17 CE. Bronze prutah. 2,04 gram. Obv. : Inscription in wreath: TIB/KAI/CAP Rev. : Palm branch; incriptian: IOYLIA, across field: LE (year 5) = 18 CE. Bronze prutah. 2,26 gram. Obv. : Inscription in wreath: TIB/KAI/CAP Rev. : Palm branch; incriptian: IOYLIA, across field: LIA (year 11) = 24 CE. Bronze prutah. 2,01 gram. 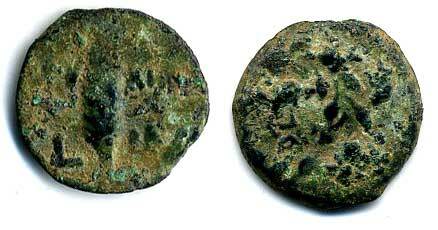 There is a slight possibility that this coins belongs to Pontius Pilatus as his first coin. 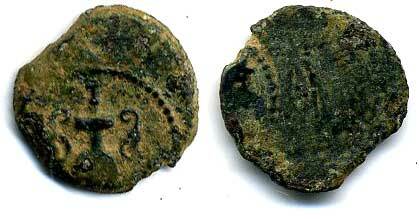 Normally it is stated that this coin is the last one of Valerius Gratus. 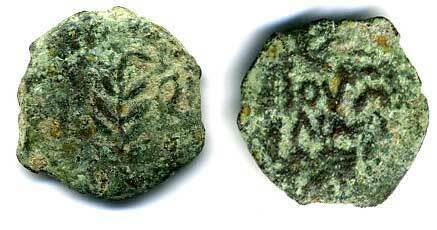 The next coins edited in Judea by the procurators are the two coins of Pontius Pilatus with pagan motives, the first has the date 29. 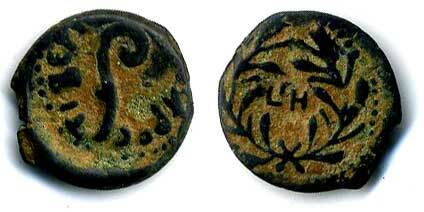 Normally a new procurator edited coin of his own in the beginning of his reign. So it would be strange that Pontius Pilatus started so late. The exact beginning of the rule of Pontius Pilatus is not clear. 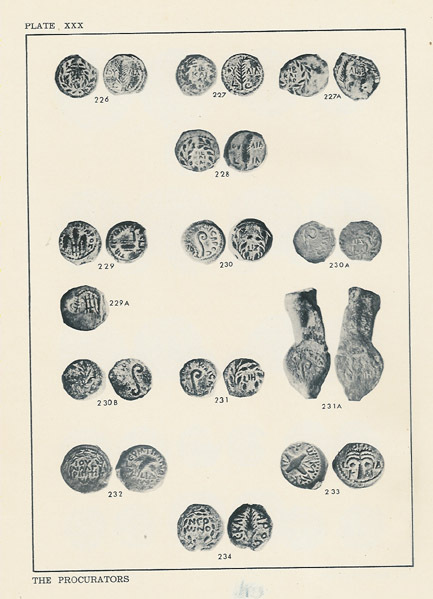 There are three dates of the coins of Pontius Pilatus, 29-31 CE. Most historians believe that one of the years around 30 is the year of the death of Jesus. Obv. 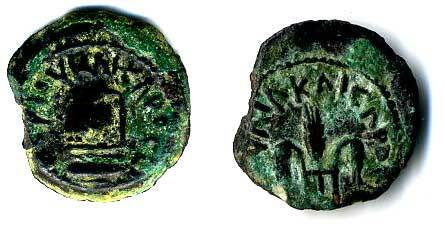 : Simpulum; TIBEPIOY KAICAPOC LIU (Year 16 of Tiberius) = 29CE. Rev. :Three ears of grain tied together; IOYLIA KAISAROS. Bronze prutah. 2,09 gram. Pontius Pilate was the Equestrian procurator of the Roman province of Judaea from AD 26-36. Typically referenced as the fifth Procurator of Judaea, he is best known as the judge at Jesus' trial and the man who authorized his crucifixion. 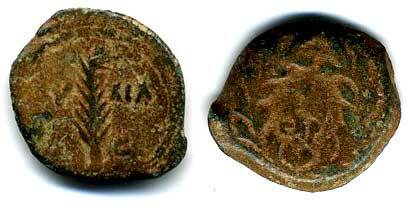 Pilatus was the first procurator in Palestine using pagan utensils on his coins. 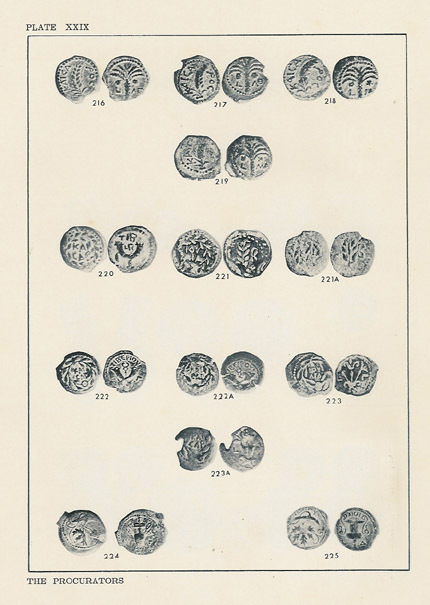 All his predecessors used only symbols tolerable to the Jewish religion. The Simpulum is a vessel for offerings in the Roman pagan cult. 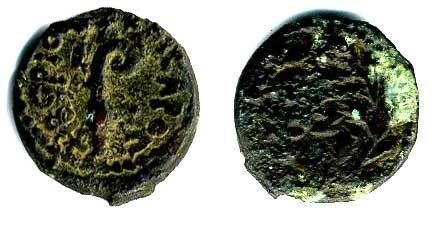 Some scholars think that the retrograde Z is maybe not retrograde and not a Z, but the Greek letter for the number 6 Diagamma, then this coin would be from the year 29 C.E. Obv. : Lituus; TIBEPIOY KAICAPOC Rev. 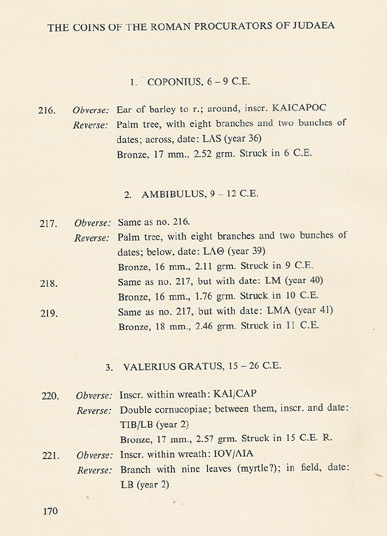 : Date in wreath: LIH (Year 18) = 31 CE. Bronze prutah.1,79 gr. Obverse: Inscription witin wreath: IOY/LIA AG/PIPPI/NA. 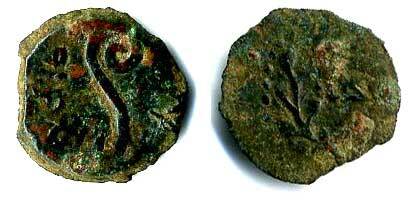 Reverse: Two palm branches, crossed, bertween them date: LID (year 14 of Claudius = 54 CE) around incr. : TI KLAYDIOC KAICAR GERM. Obv. : Inscription in wreath: NER/ONO/S. Rev. 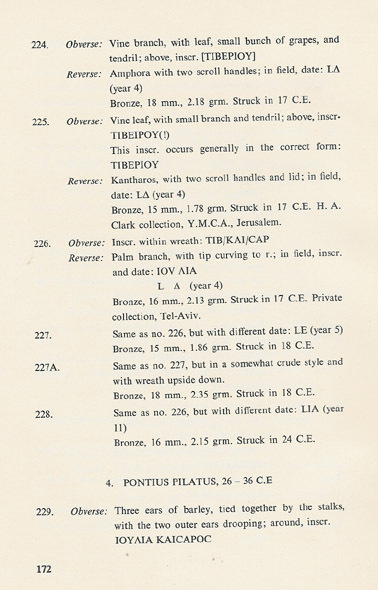 : Palm branch; LE KAICAPOC (year 5 of Nero) = 59 CE. Bronze prutah. 2,30 gram.